Wetsuits have yet to be legal for our race and we don’t expect them to be in the future. However, each age group participant shall be permitted to wear a wetsuit without penalty up to and including a water temperature of 78 degrees Fahrenheit. When the water temperature is greater than 78 degrees Fahrenheit, (but less than 84 degrees Fahrenheit), age group participants may wear a wetsuit at their own discretion but will not be eligible for prizes or awards. Age group participants shall not wear wetsuits in water temperatures equal to or greater than 84 degrees Fahrenheit. Can athletes under the age of 18 participate? Yes, athletes under 18 may participate. Anyone under the age of 18 will need a parent or guardian to sign waivers for them. We strongly encourage experience in open water swim competitions, bike racing and running races for our younger competitors before The Cowboy Up Triathlon Race Day. Can I pick up a packet for my relay team member? Unfortunately no. Each member of your Relay Team will need to pick up their own packets at one of the 3 designated packet pickup locations. This is part of being a USAT Sanctioned Event. All participants must bring a photo ID to packet pickup. Can I send someone else to pick up my individual race packet? We do apologize but cannot permit anyone besides you to pick up your packet at one of the 3 designated packet pickup locations. 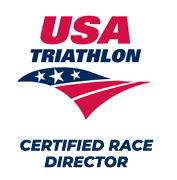 We are a USAT Sanctioned Event, therefore we have to run our event according to their rules. All participants must bring a photo ID to packet pickup. Can I get a refund if I’m unable to attend the race? We have a no refund policy. Depending on the situation, we may be able to transfer your registration to someone else. Contact us if you need further assistance. We do have the ability to transfer registration (on a case by case basis) with ample notice. Are pets allowed on race day? For the safety of each athlete, no pets are allowed to race any portion of the race with you unless they are a service animal. We do allow family pets to be a part of the day as a spectator, just not as an athlete. Woof, woof! Where do I park if I arrive late? There is no access to the park or parking from 6:45 am to approximately 9:00 am or until the last cyclist is off the bike course. We close the roads for the safety of our athletes, volunteers and sponsors. We do not permit race day registration for the current year. After the race, the following years registration will immediately be open as always. Where can I get information about weather delays on race day? We will post updates on our Facebook page should weather become an issue on race day. Is the lodging available near the race site? Hotel: The closest hotel is the Super 8 in Smithville, MO. Camping: On-site camping is available at Crows Creek – close proximity to transition area. For more information, please visit the Clay County Parks Smithville Lake website. Where can I read the official USAT rules and regulations? Are there any online training plans available?